For those of us who had a mean older brother when we were little kids, the only intersection between the human digestive system and the great outdoors might have mostly been that dare to eat an entire mud pie. But healthy intestines actually have quite a bit in common with healthy ecosystems, particularly a healthy farm environment. Are we kidding, you say? Have we been eating too much of Aunt Rita's wild mushroom fruitcake again? Nope. Read on. Application of broad-spectrum insecticides kills both "bad" AND "good" bugs. Use of broad-spectrum antibiotics kills both harmful and helpful intestinal bacteria. The insecticide-caused death of helpful insect species and insect-eating mammals allows a proliferation of insecticide-resistant pests that were previously controlled naturally. The antibiotic-caused death of helpful intestinal bacteria allows a proliferation of bowel pathogens (such as yeast) that were previously controlled naturally. Repeated application of chemical pesticides results in pesticide-resistant strains of insects. Long-term or repeated use of chemical antibiotics results in antibiotic-resistant strains of bacteria. ones. They not only help us extract vitamins and minerals from our food, their presence in our small and large intestines is essential to keeping pathogenic microorganisms in check. In nature, similarly, soil organisms create nutrients for plants, and predator insects and mammals eat and control pest species naturally. So, whether we're talking about our insides or nature's outside, balance is maintained by not killing off the good guys. There are about 400 different species of microorganisms in the average healthy human intestinal tract. 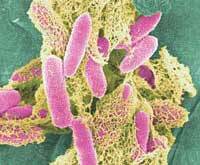 Acid-loving bacteria, such as lactobacillus acidophilus, are a normal part of the small intestine. Bacteria that are less acid-tolerant, such as the bifido-bacteria, are normal inhabitants of a healthy colon. It is a well documented medical fact that long-term use of broad-spectrum antibiotics in humans often causes secondary bowel infections—or more accurately, causes an overgrowth of certain types of digestive system pathogens. The same phenomenon occurs in nature when pesticides are used continuously over a long time. The natural balance is disturbed and problems manifest. Pest species are everywhere—in the body, around the house, in the farm field. Though they can be troublesome or even devastating, more judicious use of both antibiotics and pesticides is called for. We can never hope to rid ourselves completely of internal or external pests. We cannot "bomb them back to the stone age" without also killing the helpful species. The only solution that will work long-term is to control the unwanted species naturally, with minimal use of harsh measures. In the body, this means not overusing antibiotics and, when antibiotics must be used, reestablishing the digestive system's natural flora afterwards by taking probiotics (such as L. acidophilus). In nature, this means moving more farm acreage to organic production and, for those farms that still use pesticides, encouraging farming practices that discourage pests naturally and reduce the need for chemical pesticides. Are name-brand drugs better than generics? Do doctors have access to all the information they need about drugs' safety and effectiveness? "Powerful Medicines" offers timely and practical advice on these questions and more, and suggests how patients can work with doctors to make sure their prescriptions are safe, effective, and as affordable as possible. This book challenges the notion that the dominant agricultural landscape—bereft of its original vegetation and wildlife and despoiled by chemical runoff—is a necessity if we are to feed ourselves. The essays link conservation biology, sustainable agriculture, farming, and nature to envision agriculture in a way that yields healthy food AND ecosystems. "When I die, I'm leaving my body to science fiction."